PowerAdvisory™ is a free Windows application which provides continuous updates and information about the state of the California power grid. By utilizing data directly from the California ISO, PowerAdvisory is able to provide real-time status about the condition of the state's power grid and alert the user immediately to the possibility of rotating blackouts that become necessary during a Stage 3 Emergency. The main window provides detailed information about the current system condition, and shows an interactive graph of the days actual and forecasted load of the ISO controlled portion of the power grid. This data is updated at a user defined interval and the window can be hidden to save screen space, or made to float above all other applications on the desktop. 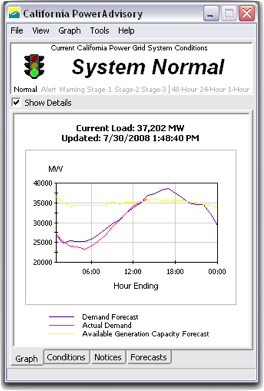 An icon showing the current condition and system wide electrical demand is continuously visible in the Windows system tray at the bottom right corner of the screen. When the status changes, a notice pops up from the task bar alerting the user to any new information posted by the CAISO, and provides a link to quickly view the details using a web browser. PowerAdvisory also acts as a Windows Dynamic Data Exchange (DDE) server, and can provide grid status information to other applications, such as building automations systems, which can then automatically take appropriate action to curtail energy usage. What is a rotating block outage? A rotating outage is a temporary and scheduled electric outage conducted under utility control that lasts approximately one hour, depending on circumstances. A utility manages and rotates the outages to protect the integrity of the overall electric system, while ensuring that no customer is unduly inconvenienced. Totally unrelated circumstances (such as a car hitting a utility pole) might also interrupt power for customers in and outside the controlled outage areas. 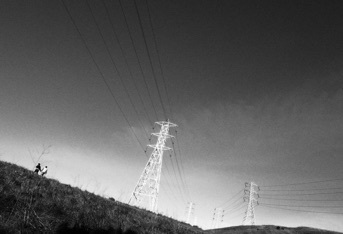 During times of peak demand, the California Independent System Operator (CAISO) and the California Investor Owned Utilities urge customers to conserve energy to help the state avoid declaring more serious shortage emergencies and the possibility of ordering more rotating block outages, aka "rolling blackouts". When are rotating outages necessary? Controlled, rotating outages can become necessary when the California Independent System Operator, the public organization responsible for forecasting and monitoring most of California's electrical generation and usage, declares a statewide Stage 3 Emergency. CAISO makes that declaration when the state's electricity reserves have fallen below 1.5% in real time or are unavoidable. Under this situation the CAISO will typically order the state's investor-owned utilities to reduce electrical load immediately by a specific number of megawatts. A megawatt is the basic unit for measuring power generation. One megawatt is enough power to serve 500-1,000 homes at any given time. To reduce its load, the utilities initiate a California Public Utilities Commission (CPUC) approved rotating outage plan in which controlled service interruptions (of about one hour) are rotated among groups of customers throughout the utility's service territories. Without controlled, rotating power outages on a relatively small scale, a widespread disturbance to the electric grid could occur, which would lead to uncontrolled, large-scale outages. You can download PowerAdvisory™ for Windows here.